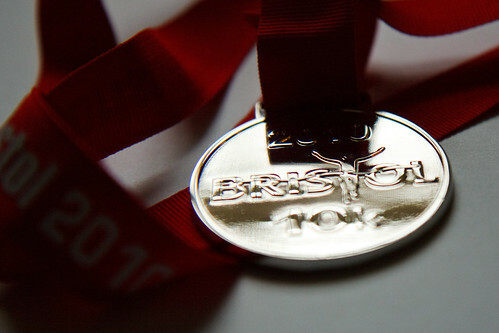 So, having checked I’d got everything about three times, I set off this morning to walk down to the start of the Bristol 10K. Everything was very civilised and well‐organised. I got a preview of what was to come by walking in through what would become the “handouts at the finish” section, where they were already stacking up space blankets, laying out trays of water bottles, and building the T‐shirt racks. 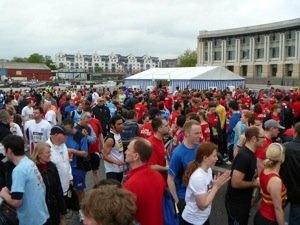 The race “village” was centred on Millennium Square, which gradually filled up with a huge crowd of what turned out to be more than 10,000 runners. And that’s a lot of Deep Heat fumes, believe me. Everyone seemed friendly, the queues to drop bags off were nice and short, and I soon found a few people from work who were running, too. Bumping into my colleagues pretty much set the whole race up. I formed up into the big queue for the slower starters — the race got going in a couple of consecutive streams — alongside some of them, including my friend and erstwhile boss Mike. As we filed toward the start, first shuffling, then walking, then at a slightly unsure, crowded jog, we stayed together. We agreed we’d go at our own pace, and if it felt like we needed to fire our iPods up and blast on ahead, or slow down and walk for a bit, that was fine, and we’d split up guilt‐free and maybe meet at the end. But, as it turned out, Mike and I run at pretty much the same pace. My carefully‐selected iTunes playlist fell by the wayside because I never felt the need for music. We just jogged along, nattering occasionally, keeping each other company while enjoying the unusual experience of having random people cheer us on every now and again. The race headed out of Bristol along the A4 Portway, under the Suspension Bridge, turning back towards the city centre again at the 4K marker. On the return leg, I heard my friend Tara cheering me along, which was fab 🙂 I was feeling fine; the weather was pretty much perfect for running, cool and overcast, but not too cold, and with no rain. And it was fantastic to run along the A4 without any traffic to get in the way, or any fumes to spoil the Avon Gorge air. We struggled up the short and sharp uphill section of flyover to cross over the water and come down on the south side of the water, to complete the loop around the entire harbour and back to the finish line. This was the bit where things started feeling a little harder. Cumberland Road, that runs in a straight line along the south side of the harbour and the north side of the river, is a long road with a slight incline, and the main thing that kept us going was the encouragement from small pockets of cheering people, and passing the 7 and 8K markers. That was definitely the bit where we just concentrated on putting one foot in front of the other and not much else. Once we got closer to the city centre again though, things got easier. The roads were lined with people, lots of support and cheering, banners, kids, people shouting out to friends they were waiting for — it was a proper welcome. We crossed over Prince Street Bridge — again, nice being able to do that without worrying about traffic — and passed the 9K marker just as we hit the Centre. Lots of music and cheering by this point, and we just kept on going. Coming up to the end, Mike said to me, “Sprint finish!” and upped the pace. I’d not even thought about that; I was in a bit of a steady‐pace trance, but I followed his lead and we crossed the line together! On the whole, it was definitely a much more sociable experience than my normal long‐distance runs. 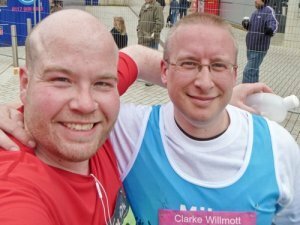 Not that I seem to be affected too much by the “loneliness of the long‐distance runner”, but running with 10,000 other people, and one running partner in particular definitely felt pretty good. It also seemed to do good things for my pace. The official times aren’t in yet, or at least not for the slow people like me. The front runner, Kenyan Gordon Mugi, managed it in a smidge under twenty eight and a half minutes, which seems almost inconceivably fast to me. But looking at my RunKeeper log, which seems pretty accurate, I think Mike and I managed to get through in around one hour and ten minutes, pretty much dead‐on seven minutes per kilometre pace, which is a lot quicker than I normally manage on my distance runs. So, that’s my race report — I honestly can’t think of a single way it could have gone better. Looks like I’ve smacked through my charity target, too, with £275 raised on my Just Giving page, and somewhere between £50 and £100 to collect from the paper sponsorship form I’ve been hawking around work. That and the fact that my company is going to match the first £250 should see me hit somewhere around the £600 mark for St. Peter’s Hospice, which is ace. Right. Think I’m going to have a nice bath to see if I can minimise any aches and pains for tomorrow. And pack my medal in my bag for the morning. Not, of course, that I want to show off. No, of course not. I just need to prove that I ran the race so I can collect the sponsorship money. And the best way of doing that is to take the medal into work. No showing off involved. Really. Ahem.